Old ale aged in bourbon barrels previously used for Michigan maple syrup. Formerly known as Kaiser Curmudgeon. What tames an Old Ale like Curmudgeons? The tender embrace of oak and sweet maple? That's what. The result is Curmudgeon's Better Half. A harmonious matrimony of our deceptively smooth Old Ale brewed with molasses and time aging spent aging in bourbon barrels that have previously held maple syrup. Because all counterpart should be sweet. Rich and utterly delicious. The most incredible beer I've ever had. I love their Crumudgeon Old Ale. It's absolutely delicious with or without a year of cold-aging. Aging it with Maple Syrup Bourbon Barrel? Incredulous. Cellar aging for almost 5 years? It was so good, I knew I had to tell the world about it. So it gets a proper review. Being as it was almost 5 years old, I suspected my bottle was beginning to hit the end of it's life. What better time to drink it than at the start of drinking during Christmas. Pours a thick, almost viscous, slightly dark, clear, honey-amber appearance into a chalice. Absolutely gorgeous appearance. The real treat were the suspended maple syrup crystals all throughout it in a proper display of entropy. Varying in size but an incredibly delightful sight. I don't think I'll ever see something like that in a beer so wonderful again in my life. No head and no points off, because it's 5 years old. Malt, caramel-like scents, a tiny bit of oak. The bourbon is very, very light on the nose. It's almost disappeared in a sense. An indicator of what's to come in the taste. Not too much earthiness as I've seen from 1-year aged curmudgeons. Room temperature. Tastes of caramel, vanilla more than anything. Small notes of the oak. The taste has become so complex it's quite hard to describe how the bourbon has become mixed in with the rest of it. I think it came out, after all these years, perfectly assimilated into the rest of the beer. Halfway through you might actually think they put some butter in it as well as strange as that sounds. There is a little bit of bitterness at the end that complements its complex flavor. Far less bitterness than there were in previous vintages. It's crowning accomplishment is having the perfect amount of sweetness to it, which is balanced out with it's other small flavors. The molasses doesn't nearly make it as thick as it did originally. Incredibly smooth. It goes down as described by how it looks and tastes. The aftertaste it left in my mouth very much made me want more of it. Drank it slowly to truly enjoy it and let it open up. I enjoyed this beer on tap at Founders in 2012. Simply sublime. Perfect. It was the most delicious and complex beverage I have ever consumed...and I have tried virtually everything Founders has produced in the last three years. 2018: Yep, this is the best! L: Clearish dark amber. Capped by a small creamy beige head. Decent retention. Streaky and spotty lacing. S: Huge sweet and toasty malt aromas. Dark fruits. Cherry, prune, and raisin, with maple, vanilla, molasses, toast, and toffee. Just a hint of bourbon. T: Huge caramel, toffee, butterscotch, and vanilla upfront, followed by cherry, prune, and rains. Thick, toasted pumpernickel bread. More vanilla. Just a hint of bourbon. Very sweet, but oak tannins cut through the sweetness. Alcohol is dangerously well concealed for its abv. Massive lingering maple syrup. F: Medium-plus, creamy, well carbonated, slick and greasy. O: A delicious sipper and dessert ale. A beautiful and well clarified amber orange color boasting golden and garnet highlights, Curmudgeon's Better Half is capped by a persistent and creamy lightly tanned foam that cones into centered iridescent coarse bubbles. A thin sheet laces the glass well. Very nice aromas, but mostly barrel influenced. Vanilla, wood, and caramel most notably. Dough basted in syrup, a touch of soft, new leather, with a light fruity element like fig or plum lies below. All barrel again. Toasted marshmallow, stone fruit marmalade, and a restrained but deliciously so oak presence. Sugar. And lots of it. This is shockingly sweet. Nice rich and full feel with a light dose of carbonation and a very sticky finish. Alcohol warmth throughout. This is fine ale, a decent Old Ale, great barrel presence. But way too sweet for my liking overall. Cheers. Holy hell! I have to be real. When I first peeped this thang, I expected something, I expected something good. But like the first time Raul laid his eyes on a Pamela Anderson nudie, he did not expect it to be that good! And Curmudgeon’s Better Half is exactly that: the first nudie that got you floored! I mean, this thang is firing on all cylinders: thick, luscious, potent, smooth... Can I say yeah buddy?! A lot of maple in this beer. Take CBS, drop the stout smoothness, add Old Ale heartiness and, surprisingly, ratchet up the maple to make this incredible beer. I really enjoy Curmudgeon, so I’m amped to try this. The pour yields a beer that’s a hazy mahogany color with a dense tan head. Lovely. The nose is rich toffee aromas, vanilla, raisins, dates, maybe a smidge of the maple, and the barrel. Lawdy, the barrel. The maple jumps to the front of the line on the taste - and it’s beating its maple chest. It lends a significant sweetness to the base beer, but the vanilla and dark fruits mount a significant defense, and the barrel, with the subtle alcohol burn, keeps everyone in line. I need to hold a couple of these for years, and I need to hold one of these for the coldest evening this coming winter, because I have no doubt this magnificent beer will shove the bitter cold out the door. so much flavor in this beauty from founders, the reigning king of huge brews. this takes the best features of the old ale, the molasses, the warming quality, and the depth of the malt bill, and amplifies it enormously. the bourbon does its typical thing, charcoal and vanilla and sweet booze, predictable. what isn't predictable here is the maple aspect. no I may personally be extremely partial to anything maple, but what it does to this beer is divine, that thin distinctive sugary flavor that is so unique really melds with the molasses flavors of the old ale and the vanilla from the bourbon. it is hotly alcoholic though, which hurts it for me, I want to pound on this and I cant or I will fall asleep or worse. still, its nicely carbonated and feels lighter than it is. classic depth of flavor, especially the maple, it adds an entirely different vibe to what was already a very good beer. this needs to be copied by other brewers, there is a lesson to be learned from this. its a landmark beer really. I could see it aging longer and improving further too. The initial pour looked a deep brownish-red with awesome clarity. Topping the beer off added lots of chunky sediment and broken-up yeast cake and really clouded the beer. The head that collected is a half moon of coarse bubbles. They haven't popped yet. I'm waiting for CBH to warm up, but I'm getting a starter waft of fresh fennel and dry caramel. As it slowly warms, one can pick up on maple, barrel wood, English malt, licorice root, milk chocolate, molasses, and faint whiskey. An aged old ale, in the nose, with featured notes of barrel complexity. Firmly steeped in molasses (not without bitterness), maple, licorice, bourbon, light roastiness, figgy fruits, caramel brittle, date, fennel, herbal elixiry sweetness, and some bitterness in the tailend. Amazingly complex. I feel like this beer probably dried up a little, too, but I can't know for sure. Has a grand appeal. The fennel/licorice presence in the flavor is really intense. Almost as much dried fruit as there is caramel. Atypical ale. Nothing like I've ever had before. Full-bodied with light tackiness on the lips. Soft carbonation. Nothing even close to 11.9% represented here. Mellowed beautifully. I wasn't expecting this kind of flavor profile evolution. I assume this has strayed from what it was, which I would've greatly enjoyed. But, I still love what it has become. Adventurous beer that I purchased already aged. Too fun. Cloudy amber-brown with a thin off-white head. Nose: bourbon, caramelized sugar. Toasted oak. Taste: bourbon and oak up front, maple comes in next. Finish is pretty sweet with maple, caramelized sugar, and a touch of oak to balance it out. Feel: medium to light body, medium carbonation. Very drinkable for the style and abv. First and foremost, I think this beer is great. But, I'll start out with my only real issue...it lacks any traditional old ale characteristics. It isn't vinous, acidic, or oxidized in a noticeable way. To me, it is much more of a barrel aged barleywine than an old ale. With that out of the way, it is still delicious. The malts and barrel notes come through clearly in the nose, and vanilla and maple shine in the flavor. Quite sweet, but the barrel and alcohol help cut through it enough to not be cloying. Solid finish as well. Damn. I'll likely go out an buy another 4-pack before it is gone, which probably says it all. Great beer. Next to Red Admiral, probably the second best of the style (barrel aged barleywine, not old ale) I've had. Orangey amber red pour with a thin, off-white head and minimal retention. Nose is lots of sweet - dates, maple syrup, coconut, treacle, milk chocolate, caramel. Also a decent dose of bourbon and wood on the nose, but not an oak bomb. Taste is definitely maple, coconut, bourbon, a little hint of fresh cinnamon, and some black tea tannic flavors and dryness. A good dose of oak, but I don't feel like I'm trapped in a barrel. Finish is a lot more bourbon, with a slight bitterness that is welcome after all the sweetness this beer packs. Pretty sticky, but not too clingy. Well balanced with all the big main profile flavors going on here, and not too hot for a 12.7% beer. Really nice BBA offering from Founders. Nice reddish tan, clear beer with a finger of dark beige foam atop. The head kicks back to an island and ring that last for the ride. Maple and oaky booze, with the maple being more a sweetness that barely hints maple, and the oak a very light scent of stave wood and tannin. Malt is a kind of honey bread aroma in this, and there are some more roasty notes as well as light herbal bitter notes in this extremely delectable and alluring delight. My goodness all the flavors of the aroma are here, blended well but discernible, balanced amazingly, with more herbal bitter and roast than was evident in the nose. It is a sweet beer, make no mistake, but it has just enough alcohol spice and bitter notes to make this perfectly balanced. Highly viscous, but not syrupy, just enough carb. to keep it lively, very clean flavor profile, def. taste the alcohol, but it is well managed as part of the flavor profile, and it has a sweet finish with deeper notes that is perfect clean linger. Very well done beer. If you are expecting a barrel bomb or a booze bomb you will be disappointed. If you are looking for an complex and delicious old ale with barrel character, light hints of maple, and an amazing drinkability, this is your jam. Pours a deep clear reddish amber hue, with a finger of foamy off-white head that slowly settles to a film and collar. A beautiful red cast is glowing onto the base of my snifter. Nose is big rich caramel malt, and a good bourbon note. So many BBA ales lack the bourbon character. This one has it in the nose. Not quite getting any maple, but there is definitely a sweetness to the nose. A good hit of booze too. Impressions of raisin, and Turkish tobacco leaf. Palate: THERE'S THE MAPLE! Yes! Another insanely difficult note to hit, and this one NAILS it! I see the hype surrounding this one for sure. Toasted caramel malt backbone, sweet maple syrup, oak, bourbon, molasses, a touch of spice. Has a little bit of brandy-soaked raisin character. A note that mildly suggests sweet licorice. This one is amazing. The maple begins to build after the sweet malt kicks it off, and then the malt retreats leaving bourbon and maple, and then the bourbon fades, and you're left with a wonderfully organic maple flavor that lingers behind. Not a heavy maple note at all, it's a note - but it's certainly there, and it's enough to put maple on the label, but it's not nearly enough to make this artificial, or a flavored beer. It tastes like they aged an old ale in maple bourbon barrels, and it's tastes like they did it RIGHT. There is a little bit of alcohol on the end and into the swallow, but it's not overbearing at all. At over 12% abv, expect to have a little bit of a boozy bite. Still drinks very well for its weight. I've had Belgian triples that were boozier than this by a LOT. Mouthfeel is heavy and rich, but not thick and syrupy/viscous. It's got some big heft, but it's not clingy or oily. It does have just a little bit of stickiness, and I like that. Carbonation is good. Light, as expected from a high abv BA ale, but it's got well enough to keep it as lively as something of this weight can be. A little bit warming as it's going down the hatch. Overall, Founders nailed this. I've had some big maple beers that just missed the mark on the maple note, always ending is some disappointment. This one has just enough to make me happy. Huge flavor, huge character, big, warm, just boozy enough...it's incredible. Get this if you can. Another big beer gem from Founders. These guys can really produce a top notch big boy. Maple syrup and bourbon? Yes, please. Sweet, but not over the top. Good mix of vanilla and oak thrown in with malty sweetness at the end. Love the way the flavor changes as it warms. Absolutely delicious and decadent. A great beer for the upcoming holidays to share with friends after a big meal. Getcha sum!!! 12oz bottled 8/14/18 (42 days ago) poured into a Duvel glass at fridge temp 12.7% ABV per label. The beer pours mostly bright in a dull brown amber color. The head is mocha colored and, after a hard pour, settles out to an island and thin ring. Slight lacing. The aroma is mild bourbon with vanilla and maple sweetness. The taste is kinda amazing. Mildly sweet with maple, vanilla, caramel, oak and just enough drying bourbon to balance the whole thing out. The mouthfeel is medium to full bodied and the carbonation is medium to low. There is no perceived bitterness or hop presence in taste or aroma. No booze in smell or taste, even as it warms. Overall, outstanding. I like big, malty beers and this is one of the best I've ever had. Delicious. Poured a brown body with one-finger head that sticks around and left a lace ring around glass. Boozy, malty aroma with hints of maple and wood. Thick, heavy body, sweet tasting beer, ABV is mostly well-hidden but is noticeable, love the sugary maple sweetness that is still easy to drink and this is a dangerous slow sipper. Bottled 8/13/2018, Poured from 12 oz. bottle into tulip glass. It pours an attractive ruby color with orange hues and a thick cap of a color between tan and ecru, with spotty, creamy lacing. Its fragrant nose features black cherry, raisin, oak, vanilla, and subtle bourbon. It's very quite with notes of maple syrup, cherry, cola, oak, butterscotch, and toffee up front. The bourbon flavor really kicks in at the finish. At first, it's like drinking two distinct beers but as the glass warms the tastes blend better and the flavor really improves. It has a thick, somewhat syrupy feel with moderate carbonation, and your can really feel the 12.7% ABV. Overall, my initial reaction was that this ale is too sweet but as the glass warmed it became more balanced. It's nonetheless a sipper more appropriate as a dessert beer than for casual drinking. It's a nice novelty beer but I prefer the base Curmudgeon, which is far more versatile. SMELL: Smells like fresh cut wood and a Colorado forest after an afternoon shower. Some dark fruit lingers behind that along with a big, malty character. TASTE: It’s molasses. It’s vanilla. It’s oak. It’s big maple. It’s ultimately bourbon maple syrup, somehow, without being too sweet. It seems impossible, but this is nearly perfect flavor. MOUTHEEL: Rich, delicious, smooth, velvety, yet not overwhelming or too intense. It’s like a medium rare, Kansas City strip steak on the texture. Just a touch of sparkle, enough to prevent this otherwise viscous brew from not feeling like beer. OVERALL: Gorgeous is the best possible word for Curmudgeon’s Better Half. The original is an all-time favorite of mine, but the better half is just insanely good. Lively, exciting to the taste buds, yet refined, mellowing, and soothing. This might be my new dessert island beer. So happy to see it in 4-packs. 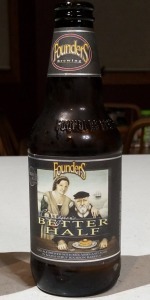 Founders Brewing Company "Curmudgeon's Better Half"
12 fl. oz. brown glass bottle, "Bottled On: 08.13.18 1524 6 12.7% alc./vol." Notes via stream of consciousness: OK, old ale aged in maple syrup Bourbon barrels, got it. It's poured a hazy chestnut brown with light ruby accents beneath a finger-thick head of yellowed off-white foam. There's a lot of particulate in suspension; and the head seems to be dropping fairly quickly. The aroma clearly exhibits Bourbon and oak, and some caramelish malty sweetness. I almost feel that the Bourbon and oak are a little bit much, but let's see how I feel as we progress. On to the flavor... oh, I should note that the head has now completely collapsed and I have a very thin, not quite solid surface covering. The lacing that's been left where the head once stood is pretty solid though. Thin, but solid. OK... ahh, I'm getting the maple syrup in the flavor... maple syrup, golden caramel, toffee, medium caramel that's just starting to take on a reddish color, coconut, a smear of melted milk chocolate... it's pretty complex. It's sweet, and even sugary, but it's also bitter, and when some of the sugary malt subsides in the finish the bitterness appears. Usually, a little bit of sugar appears beyond that, but then the alcohol shows up and scrubs that right down. I'll say that for the most part it's balanced considering how big it is. And it is big, 12.7% abv AND there's so much residual sugar left! It must be a monster of a mash. And it seems that way in the mouth with its full, dextrinous body. A median carbonation lends it a gentle bristle upfront before warming to become smoother. The further I progress the more the alcohol shows, and that's not really good, but it's not hot or anything. Overall I'm pretty impressed, it's one of the biggest, sweetest beers I've ever had. It would make a good nightcap beer. 750ml bottles of this were inexplicably cheap at my local bottle shop. I've had this on tap a couple times but never when I was in a state to do a review, so I snatched up a couple. The pour is very lively for the ABV. Dark red, heavily effervescent with a nice, tight champagne head. Smells like heavy malt, medium booze, and some clear syrup. Not as bold and sweet as a maple stout, but that makes for a more accessible aroma, imho. Tastes incredibly smooth. No booze or bourbon burn whatsoever, which is nice. Vanilla DOMINATES throughout. This reminds me of the first time I had Bourbon County, in like 07 or whenever, when I likened it to the way imitation vanilla syrup smells (in a good way). Only this comes after an additional decade of my pallet being abused. Very impressive. After a few sips some complexities become noticeable. Vanilla up front, a very smooth old ale in the middle, and pecans and mild stout malt on the finish. The vanilla is still the defining characteristic, but there's plenty going on to keep everyone interested. Frankly, I'm burned out on bourbon aged beer. Most of it isn't very good. I say we rush to usher in a syrup revolution. Let us grow rotund off the discarded fruit of the maple tree. A - Dark amber orange pour with a caramel colored, thick creamy layer of sticky foam on top and light carbonation. S - Bourbon, some toffee malt, and maple. T - Bourbon is up front and aggressive from start to finish with alot of alcohol effervescence and moderate warming on the way down. Vanilla, bourbon, oak, toasted sweet toffee caramel malt, light traces of butterscotch, and ends with a lingering bourbon vanilla with slight pine bitterness. M - Full bodied, slick, velvety, and sugary sticky on the lips. O - The first few sips were hot, boozy, and obnoxious. About 1/4 in the palate adjusted and more flavor came through.